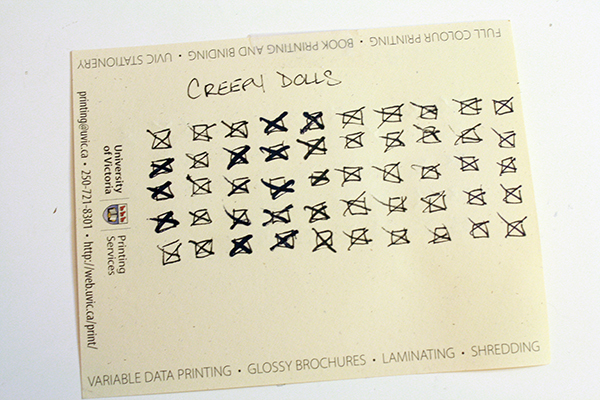 Back in the fall, my friends over at LoadingReadyRun contracted me to make 50 Creepy Dolls for their Kickstarter. This is a plushie of a longtime LRR character with a bit of a random history. 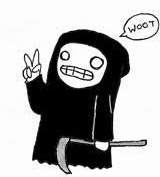 The Creepy Doll first appeared years ago in Kathleen De Vere’s webcomic Korea, as a character called the Littlest Reaper. 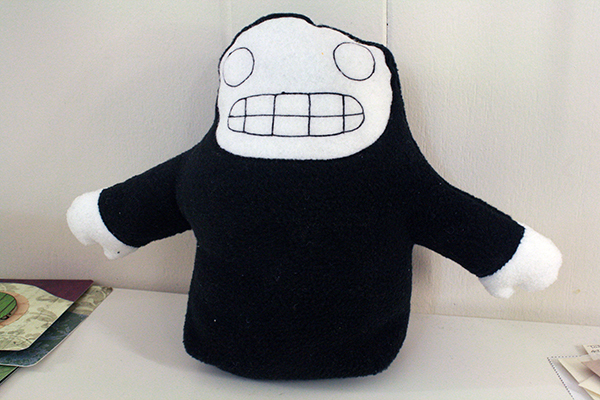 Kathleen later made a plushie of the character for Graham. 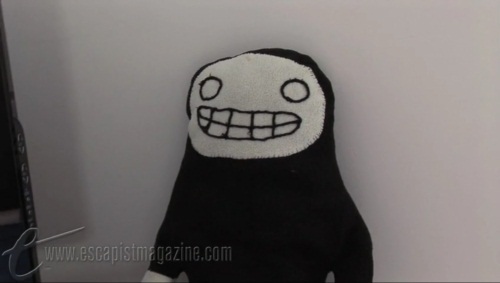 The plushie appeared in a LoadingReadyRun video at some point and quickly became sort of a LRR meme, both enchanting and terrifying viewers. Kathleen’s original comic character, the Littlest Reaper, and the very first Creepy Doll plush, also created by Kathleen. 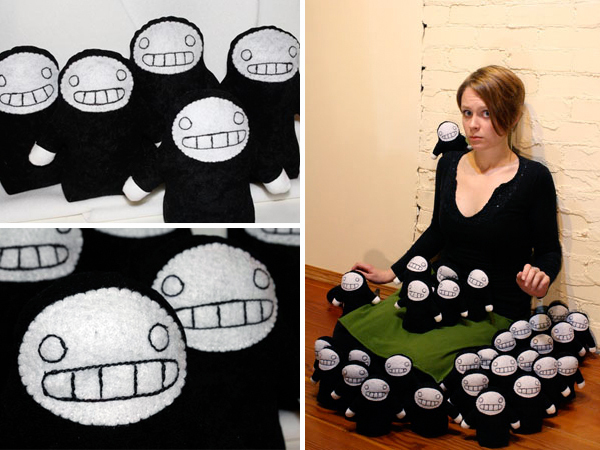 This led to LoadingReadyRun commissioning me to make a series of 31 tiny Creepy Doll plushies in 2010. 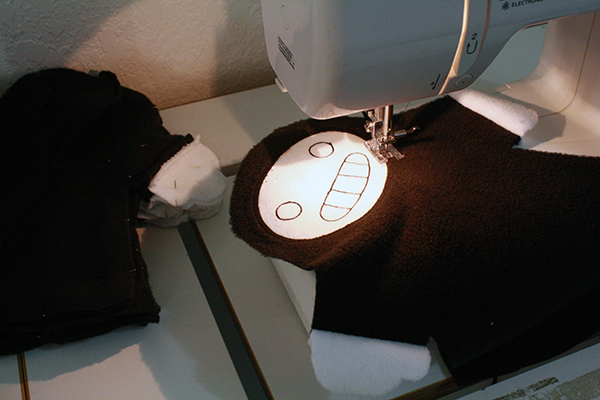 That was the very first time I sewed a large group of the same plush, which was quite exhausting and very much pushed my plushie-making skills, which were still pretty limited at the time. 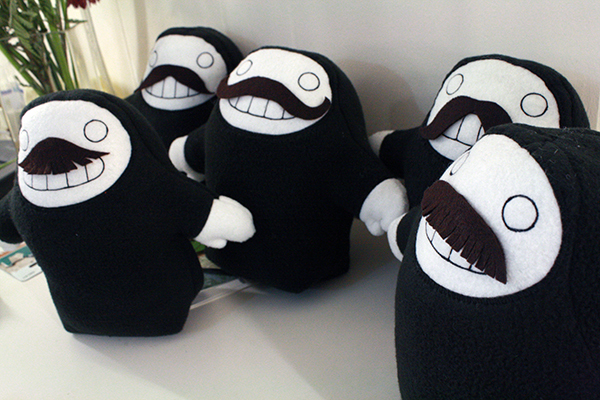 The first set of Creepy Doll plushies. 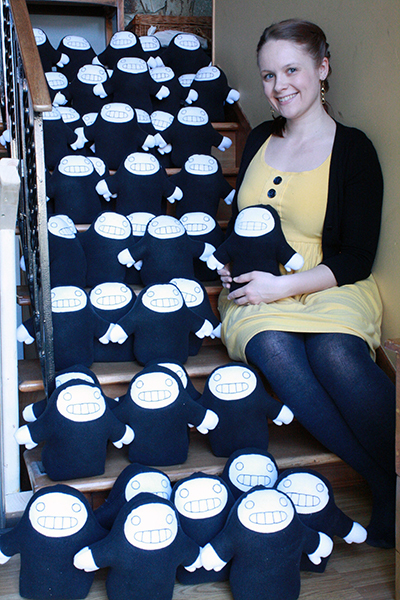 And I thought that was a lot of plushies to have to make! 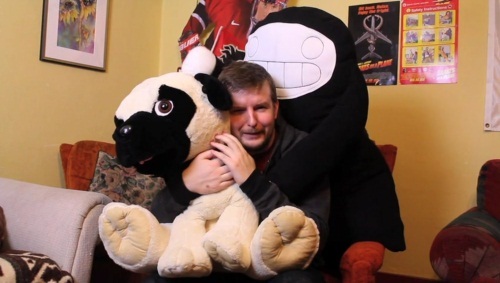 And then, a couple months later, a casual, somewhat joking conversation was had about writing a giant Creepy Doll into an upcoming video script, and that turned into me bullying Graham into actually writing it in and thus forcing myself to create a massive-sized Creepy Doll plush in about 6 hours, because I really don’t know how to protect my own sanity and wellbeing when it comes to crafting. Harry the giant Creepy Doll, who above all loves terrorizing Graham. Changes that did work were giving them thumbs (yes, they now have opposable thumbs, be very scared), and using sewing techniques I’ve learned in the past few years to place their faces inside an outer window of fabric, rather than appliquéing them overtop of the body. 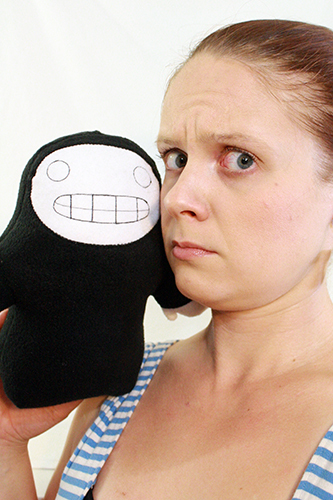 The new Creepy Dolls were made out of fleece, and so are softer and cuddlier. I’m also much better at doing small tidy machine stitching for their faces now, and have finally learned enough to know how to use a template to trace the faces on so the proportions and spacing on each face would be identical (for the first run of Creepy Dolls, I just freehanded it). 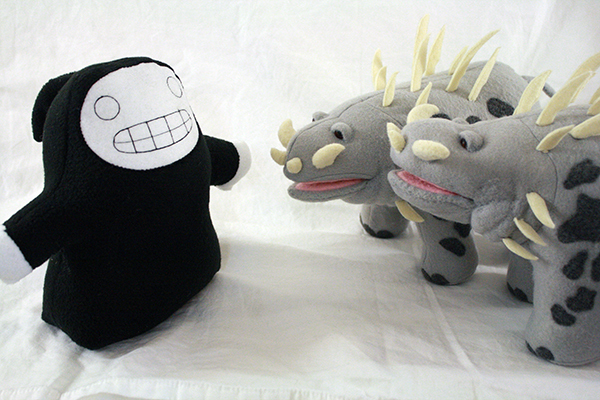 So I sorted out the prototypes for the Kickstarter and all the dolls were very quickly claimed. 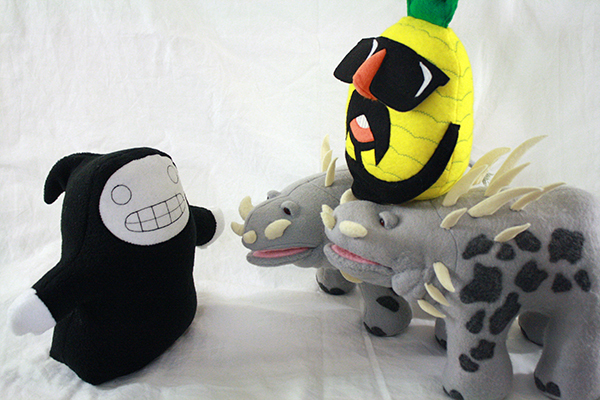 Then I went off to deal with that big Desert Bus for Hope thing and completely ditched all sewing for a while, then I finished and shipped all those Kobolds, made 50 Pineapple Maki plushies and then I got to work on Creepy Dolls. There was some goofing around in the midst of serious sewing work. Also, the Creepy Dolls interfered a bit with packing, because we were getting ready to move house at the time (all of 2 weeks ago). 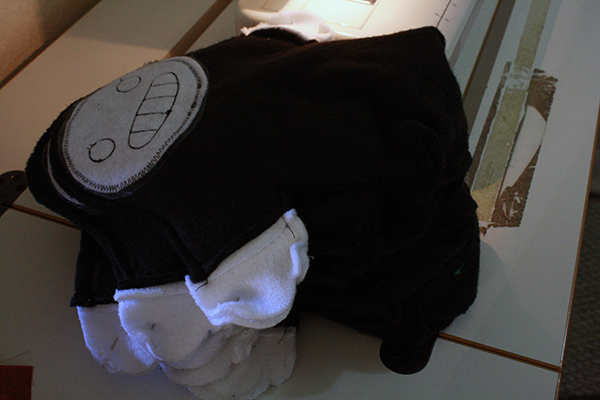 I’ve said before that every big plushie project presents new challenges, and some things are easier for each project, while other things are more finicky and frustrating. 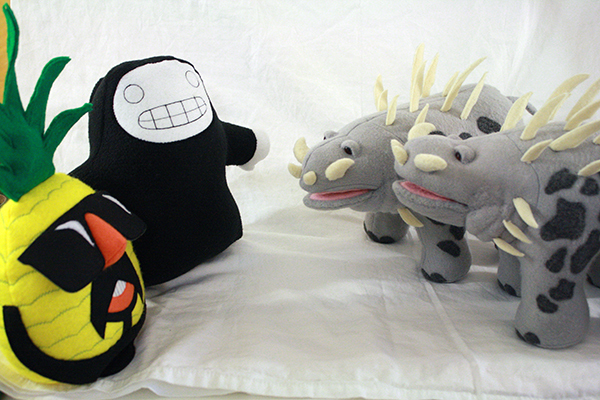 And what those things are changes with each different plushie. Usually they take me somewhat by surprise. Well the main frustration of the Creepy Dolls was definitely not one I expected. I had tiny but significant pattern problems, long after the prototypes were done and I’d started production and thought the pattern was all sorted out. It’s a very simple pattern, but sometimes those are the ones that cause the most trouble if they’re not exactly right. 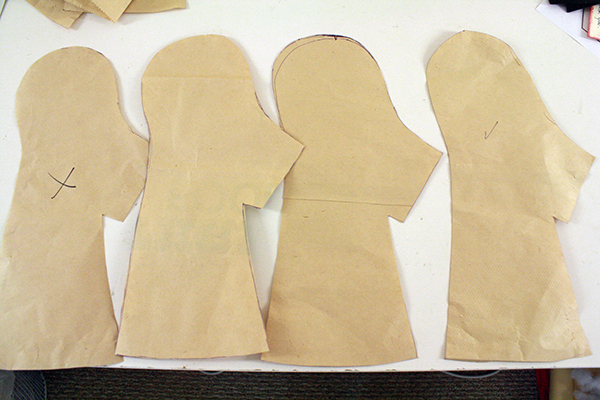 The backs of the Creepy Dolls were made of two pieces, sewn to the one front piece. This gave them a bit more, well, body. Roundness. But the place where the two halves of the back piece connected caused me no end of trouble, and the first 12 or so Creepy Dolls had to be unstuffed and have the tops of their heads partially restitched to correct it. It then took me no fewer than four more tries to get that one bloody pattern piece just right, and the adjustments I was making to it were miniscule. Here, you can see what I mean. 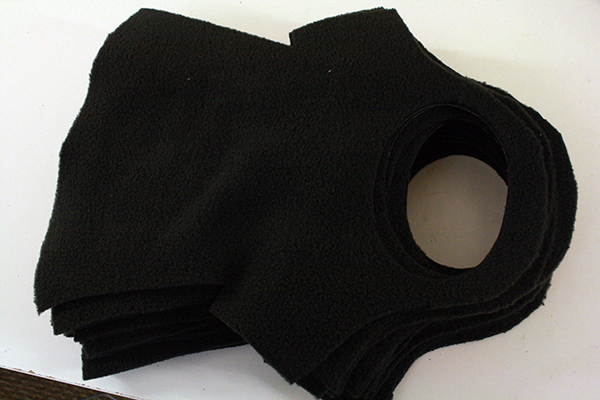 Below are three failed pattern pieces, with the one that finally worked on the far right. They don’t look much different, do they? But use the wrong one and you get the result on the left below, basically a dent in the top of the Creepy Doll’s head. Use the right one, and you get the desired result of a nicely curved dome, like on the right. Good grief that was frustrating. But I finally got it sorted, and production continued. I also numbered each doll with stitches (rather than fabric pen) this time, which is something I’ve now gained enough control on the sewing machine to be able to do. 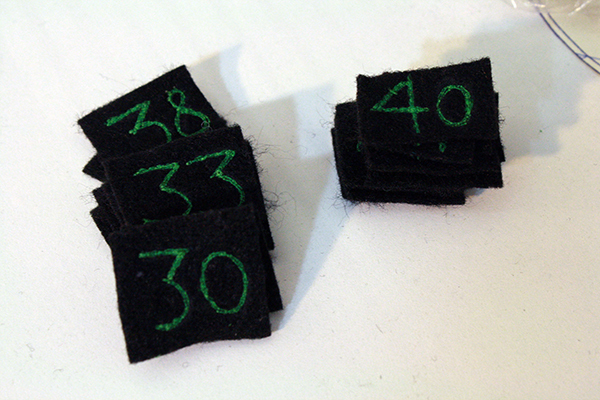 The fleece bodies of the dolls were too fluffy to show the numbers well, so I sewed each number on a piece of black felt, then stitched one of those to the bottom of each doll. 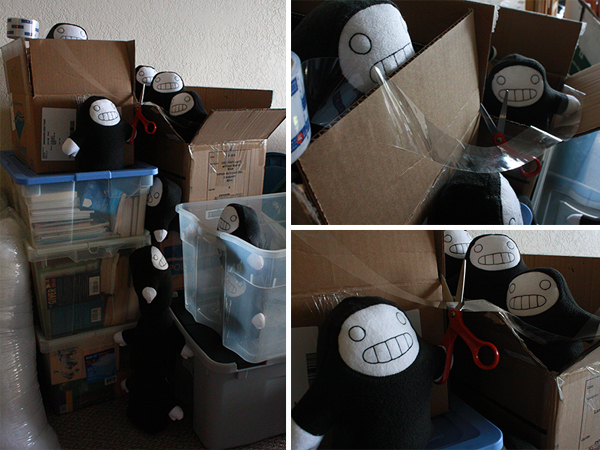 Between sewing dolls, I prepared for moving, in part by cleaning and packing my craft room. 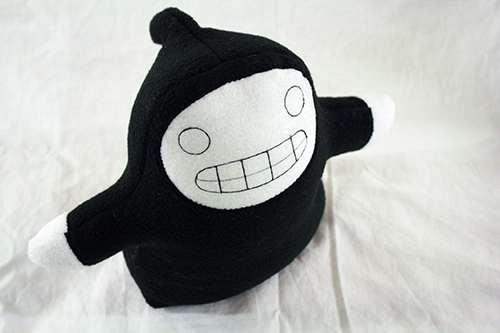 While doing that, I came upon another prototype doll, the very first one. It turned out so very badly that I didn’t even finish stuffing it, just pushed it aside and started over. Below is a picture of it, not quite fully stuffed. Another demonstration of how the smallest pattern changes can make all the difference. Its arms were just a bit too long, its face just a bit too tall, and its head didn’t have quite the right curve. Small things, that overall made the final result look absolutely terrible. Well I hate to waste materials. I unstuffed it and used the stuffing in one of the new dolls. Then I looked at the unstuffed shell of this doll, and thought it would be wrong to just throw it in the trash. So I stuffed it inside one of the new Creepy Dolls. Yes, one very lucky (or possibly very unlucky) backer is going to receive a Creepy Doll stuffed with the empty shell of another Creepy Doll. If that doesn’t terrify you, you’re very brave, or perhaps just very foolish. The double stuffed doll is slightly heavier than the others, but you can’t tell that without directly comparing it against another doll, nor is it noticeably lumpy. But I made note of which doll was so stuffed, since they’re all numbered. No one else knows the number, only me. Once LoadingReadyRun has mailed out all the dolls, I will reveal the number, and we’ll see where that particular doll ended up. 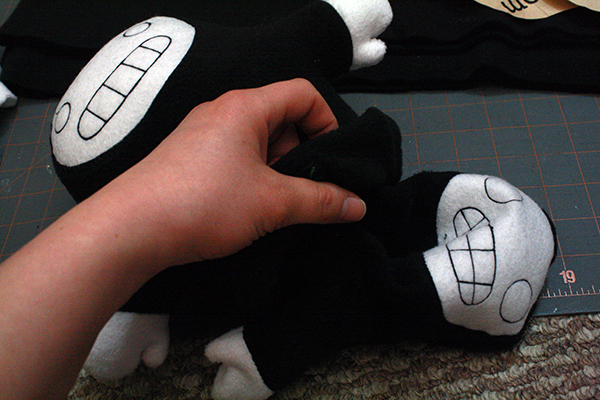 That was probably my very favourite moment of making the Creepy Dolls. Up until the final photoshoot, that is. 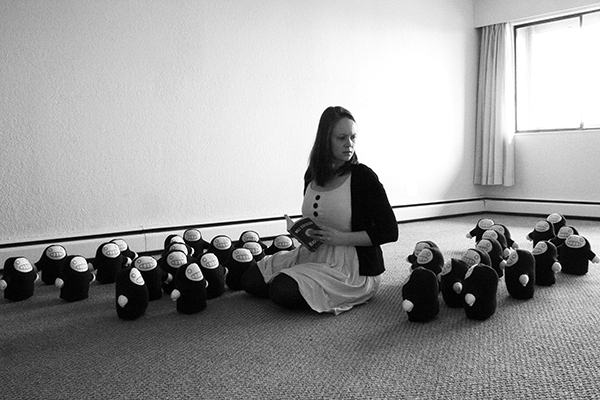 When the dolls were all done, right as we were moving out of our apartment, I did one last photoshoot with them, as I always do with these big groups of plushies. I’ll be sharing those photos in another post, which I will put up tonight at midnight, PST. Until then, here’s a preview. EDIT: Bonus photos! Found these pictures in my files, pictures of the shark fin Creepy Doll prototype meeting some of the other occupants of our house at the time.